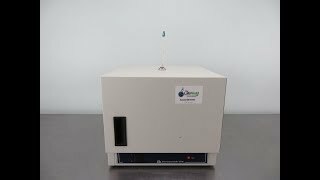 The Barnstead Lab line 100 Incubator provides reliable rugged construction in a compact benchtop footprint. This lab incubator has a bimetallic thermostat for excellent heating uniformity and control, with 1” of fiberglass insulation and a positive latch door for the best stability. The Barnstead Lab line 100 Incubator comes with a red line, spirit filled thermometer that is NIST accurate, and contains no mercury. The interior chamber of this space friendly incubator is built form corrosion resistant aluminum, with shielded heating elements that help to eliminate safety hazards caused by a spill. This gravity incubator, with a temperature range of Ambient +5° to 40°C, is an ideal choice for bacteriological cultures, hematology studies and chick embryo studies, and its compact size means you can keep it nearby without taking up too much real-estate on the bench. This Barnstead Lab line 100 Incubator has been fully inspected and heated without issue. All or our lab equipment comes backed with our standard warranty. Should you have any questions, please don't hesitate to contact us.